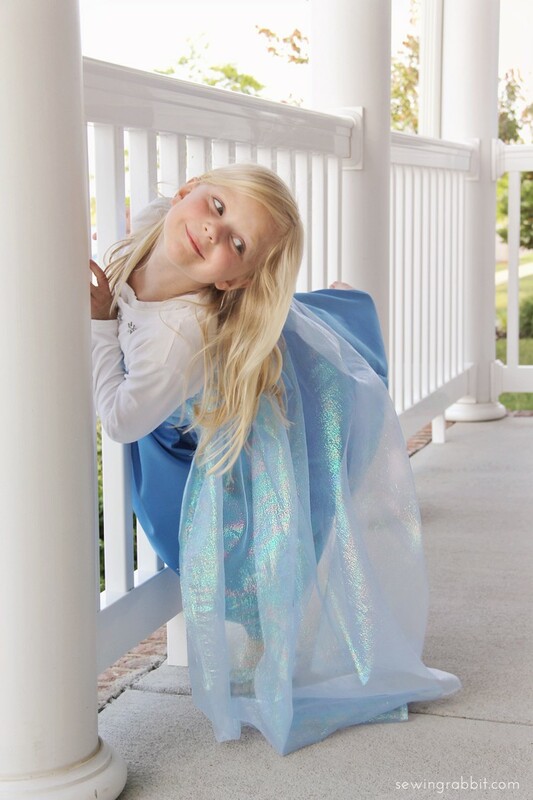 For those of us who have children under the age of 10, the movie Frozen has become a household name. Most parents know every word to every song, as well as the YouTube parodies that go along with these catchy tunes. 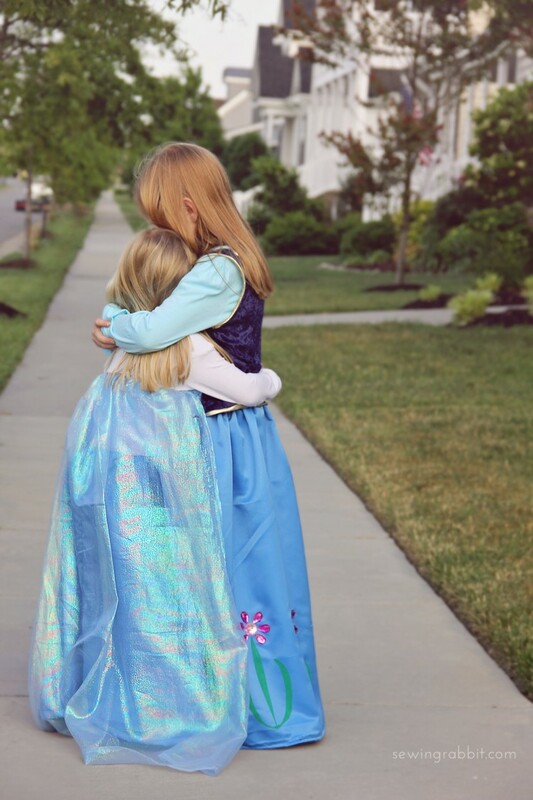 My girls have literally been begging me to make them both Anna and Elsa costumes ever since they saw it on the big screen, and once I saw that this Frozen phenomenon wasn’t going anywhere anytime soon…I accepted the challenge. You can choose whether or not to have short or long sleeves on your dress, I opted for long thinking of cooler Halloween temperatures. Let’s get started. 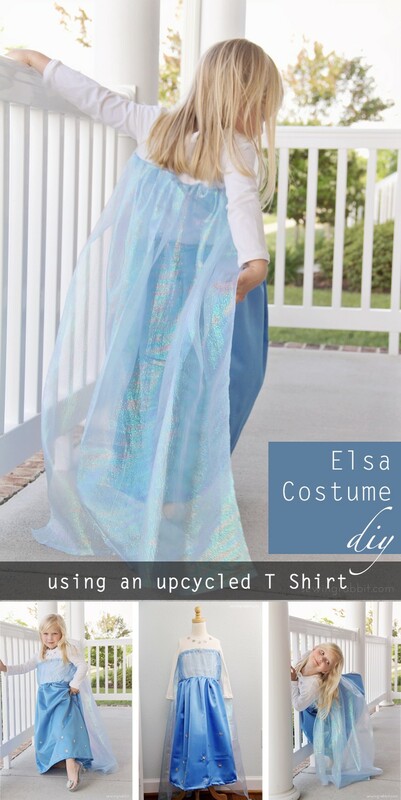 Lay your glitter / sheer light blue bodice fabric on top of your T Shirt, starting underneath your arms. Cut (2) panels that are about 6″ wider than your T Shirt, with the length being the same as your T Shirt length. Place those (2) panels right side together, pin and sew side seams. Fold the top edge of your sheer bodice tube down 1″ towards the wrong side of the fabric. Pin all around the bottom folded edge securing it in place. Sew a straight line around the bottom pinned edge, leaving a 2″ opening. You have created a casing for your 1/4″ elastic. Slip a safety pin onto one side of the 1/4″ elastic, and thread through your sheer bodice casing created earlier. Pull the safety pin all the way around the casing, making sure not to let the other end of the elastic slip inside. Once the safety pin is all the way through, pin both ends of the elastic together and sew using a zig zag stitch. Slip sewn elastic ends inside of casing, and sew casing closed using a straight stitch. Slip your sheer bodice, right side out, around the outside of your T Shirt until the elastic top is just underneath the arms. Pin in place all around the T Shirt at the elastic line. Do not sew yet! Measure your child from their shoulder blades down to the floor. This will be your cape length. 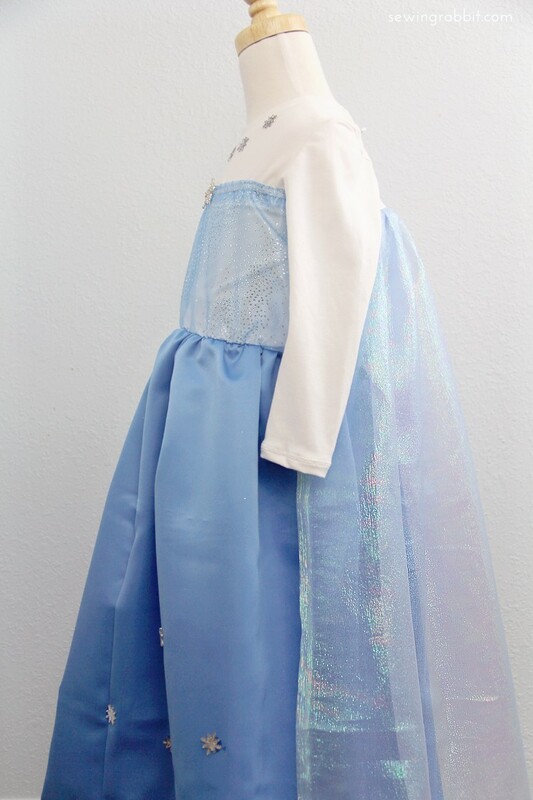 Cut (1) panel of the light blue shimmer or glitter tulle fabric your desired cape length x 40″wide. 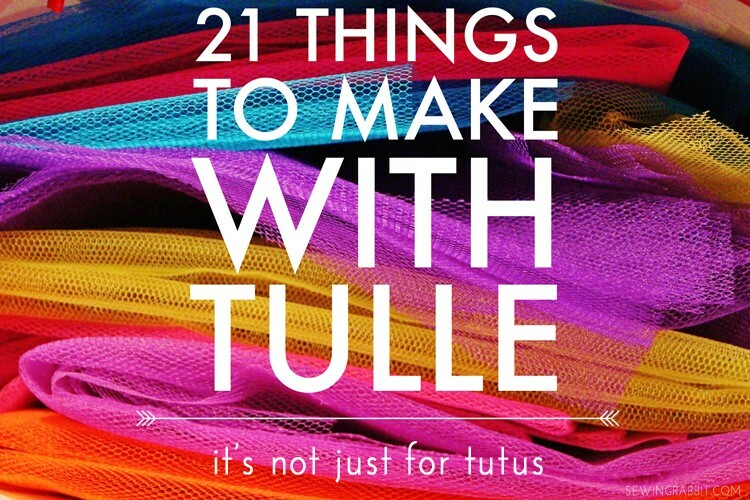 (Hopefully you used a tulle, so that you do not need to worry about hemming. If not, then turn all sides and bottom of the cape under 1/4″ and press. Turn again 1/4″ and press, sew.) Sew a line of gathering stitches along the top edge of your cape and pull the bobbin threads until the top of the cape is the same width as the back of your T Shirt. Slip the cape’s gathered top edge in between the pinned elastic and the T Shirt, with the right side of the cape against the right side of the shirt. The cape will be facing upwards, towards the shirt’s neckline. Pin. Using a zig zag or stretch stitch, sew around your pinned elastic area, gently pulling on the elastic as you sew in order to maximize stretch and keep the dress comfortable when slipping on / off. Measure your child from waist to floor. This is your skirt length. 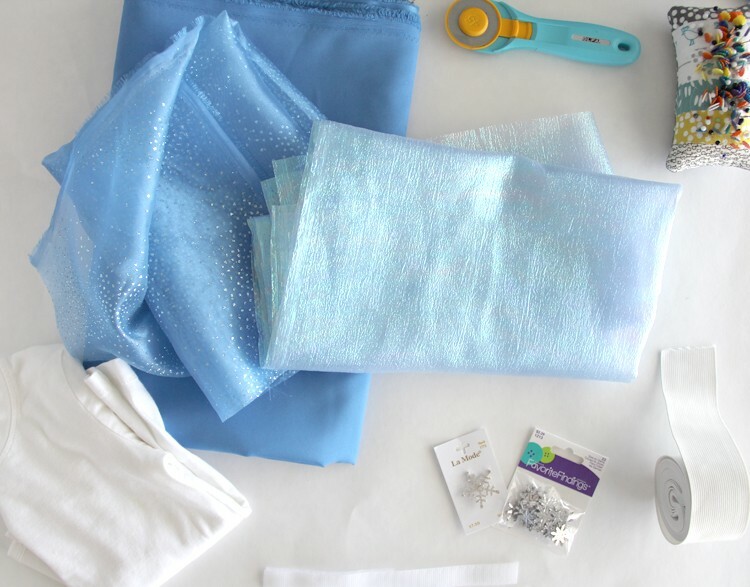 Cut (2) skirt panels from the light blue sateen or silk fabric your desired length by 22″ wide (cut wider panels for a fuller skirt). Place panels right side together, pin and sew the side seams. Finish seams if desired. Turn the bottom of your skirt 1/4″ towards the wrong side and press. Turn under again 3/4″ and press. 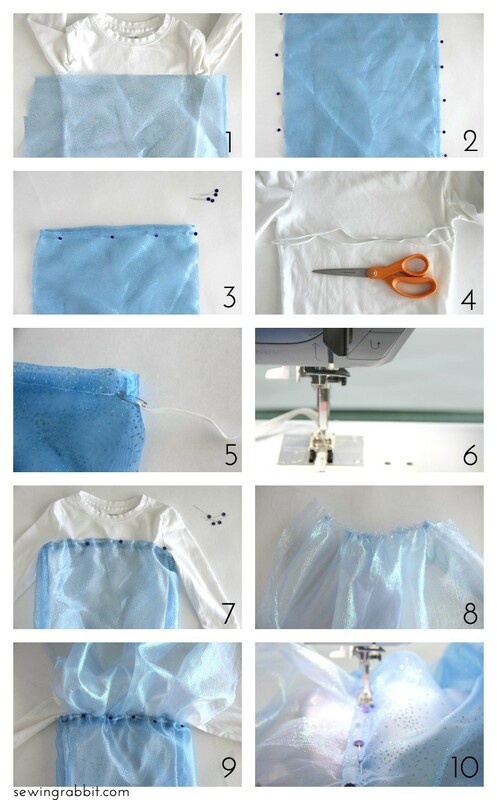 Pin and sew around to hem. Measure your child’s waist circumference, and subtract 2″ from that number. Cut a piece of 2″ wide elastic this measurement. Place the 2 short ends of your elastic together and sew using a 1/2″ seam allowance, creating a tube of elastic. Slip the elastic around the top edge of your skirt, right sides together. 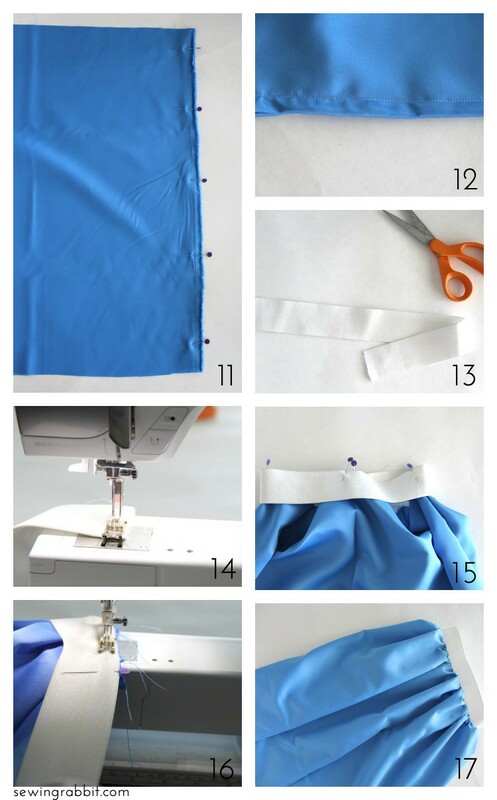 Pin the upper edge of the elastic to the 4 sides of your skirt (front, back, 2 side seams). *Please note – the elastic will be much smaller than your skirt’s waistband. You will need to stretch the elastic when you are sewing A LOT in the next step. Sew using a zig zag stitch or stretch stitch, pulling the elastic as you sew so that it is equal in width to the skirt’s waistband. Flip the waistband up, and you have finished your skirt. You can unofficially just slip the skirt over the shirt and be finished. If you want to turn it into a full dress, which I knew my girls wanted, then continue on below. You should have your bodice and skirt finished. Now lets sew them together. Turn your skirt wrong side out. Slip the waistband over the top of your shirt, bringing it down towards the bottom of your shirt. Stop when your elastic skirt waistband is around the natural waistline on your shirt. Pin in place to secure, making sure it is as even as possible around all sides. Using a zig zag stitch or stretch stitch, sew the skirt to the shirt all around – making sure to pull or stretch the elastic as you sew. Try to sew directly beneath the previous sewn line on your elastic. Trim off excess shirt / bodice hemline, underneath the elastic waistband, to eliminate bulk. 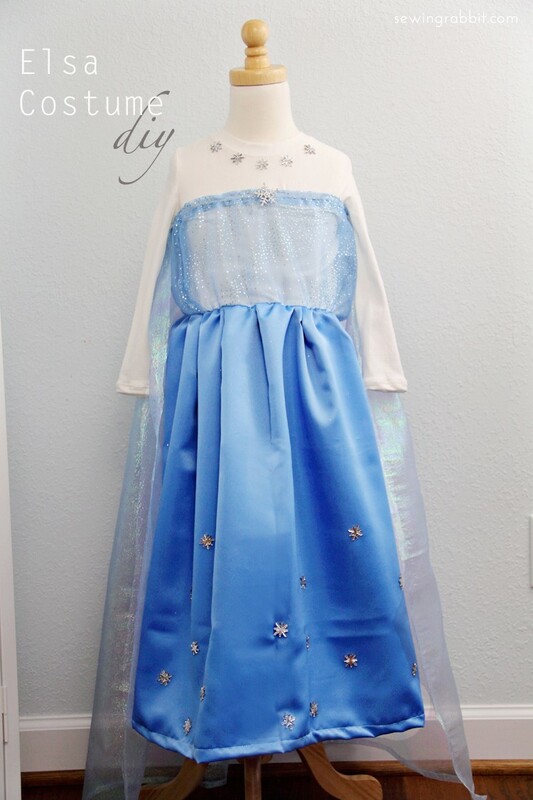 Pull skirt down, and you should have a finished dress – minus the snowflake bling. 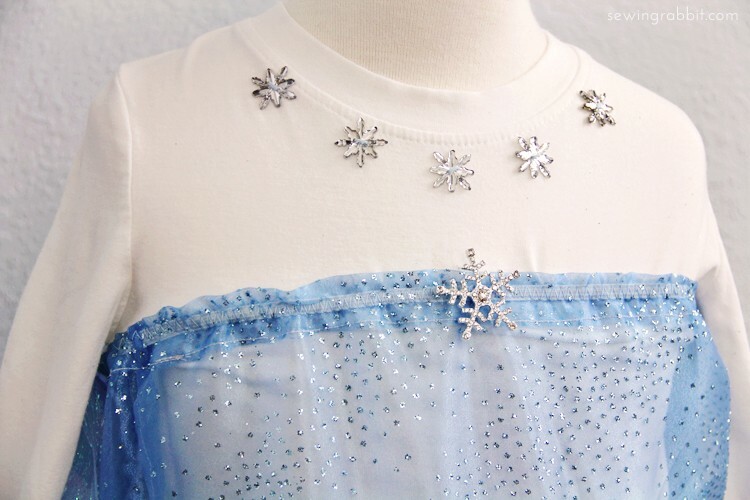 Using either a needle and thread or fabric glue, attach various snowflakes or rhinestone embellishments to the bodice top and neckline. Allow time to dry, following the instructions on your fabric glue if applicable. If desired, repeat this process for the skirt in various places. Yes, those are Cinderella shoes. But they LIGHT UP! Lol – kids :). 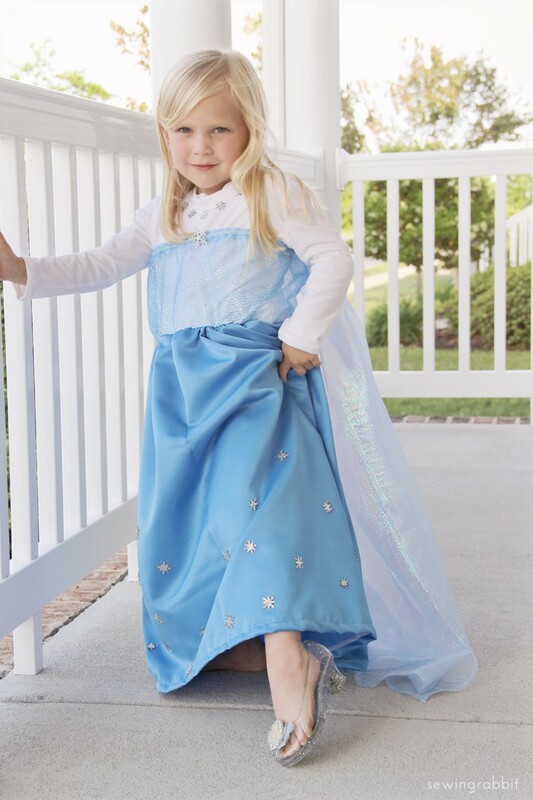 PS – naturally her sister needed the corresponding Anna dress. Click here for the coordinating Anna Dress DIY. Really cute Jess!!! Also, I love your tutorial format!!! Thanks so much for taking the time to make this tutorial, Jess!!! I just want to say thank you os much Eliana. This is quite possibly the BEST comment I have ever received. You just MADE MY WEEK. Thank you. I am so happy you likes the dress tutorial, and that it worked for you! I made this dress for my 4yr old for Halloween and she is ecstatic!! Thanks for the pattern. did you add elastic to the bottom of the shirt too or just the skirt? I’m new at this and not sure if I should add elastic to the circumference of the shirt or her waist?